Directions for viking knit chain are fairly straightforward, but maybe not easy to grasp at first. A video tutorial, free instructions and a more comprehensive tutorial await you! What is Viking Knit Chain? 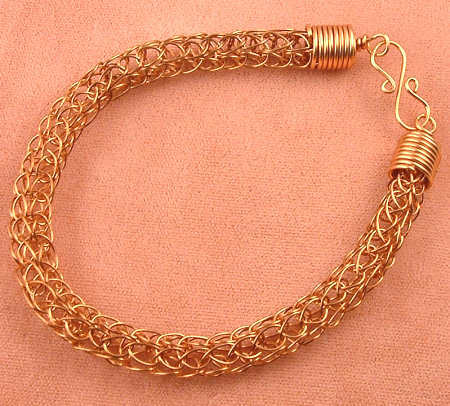 First, what is viking knit chain, and what does it look like? You can see an example in the photo to the right as well as in my viking knit gallery, so let’s quickly go over what is viking knit. Viking knit is a wire chain consisting of loops. The loops connect together to form a tubular chain, which can then be made into jewelry. Viking knit is normally done in either single knit or double knit forms. Triple knit is also sometimes done with very fine wire. The photo you see is a single knit chain. Normally I might draw the chain down farther for a viking knit bracelet, but I liked the lacy look of this particular piece. To make viking knit chain, you need a dowel, a draw plate and wire of a suitable gauge (usually 24 or 26 gauge). When it comes to directions for viking knit chain, I have three ways for you to learn to make it. The first two ways are free, the third will cost you a small amount (but is comprehensive). First is the video instruction for viking knit. It’s a nice overview and shows how the loops are made. The second is a free online tutorial that has some good photos. It teaches single knit viking chain. The third is a tutorial I wrote in response to requests. It covers single knit, double knit, wire, using a draw plate, a project and more! So my suggestion to you is look at the two free directions for viking knit first. If they answer all your questions, great! That’s all you need to know to make viking knit jewelry. If, however, you want more in-depth instruction (with lots of real-life photos), then I suggest you go ahead and purchase the ebook tutorial for $10. All set? Here’s the video, which teaches using the allen wrench and bench vise method. Directly below the video are the links to the free instructions as well as my own tutorial.